HockeyBuzz.com - Ryan Wilson - Justin Schultz to the rescue? Justin Schultz to the rescue? Florida was good to the Penguins last week when they acquired Nick Bjugstad and Jared McCann from the Panthers. Florida was not kind to the Penguins this weekend. The Penguins were only able to acquire a single point in the standings and are now gripping to the last playoff spot in the Eastern Conference. A win by Buffalo over Winnipeg today and the Penguins will be tied with the Sabres. A win by Carolina and the Hurricanes will jump over the Penguins with one more game played. My suggestion would be to spread the wealth. Let Sidney Crosby keep Kris Letang, but take a Dumoulin-Schultz pairing out for a stroll. Kris Letang is unaffected when Dumoulin plays with somebody else. Letang over the past three years has a CF% ~54 with or without Dumoulin while Dumoulin sinks to 48% without Letang. In 320 minutes with Schultz Brian Dumoulin has a CF% of 53.4%. I think Dumoulin-Schultz can be effective and it would give another forward line some competent puck distribution. 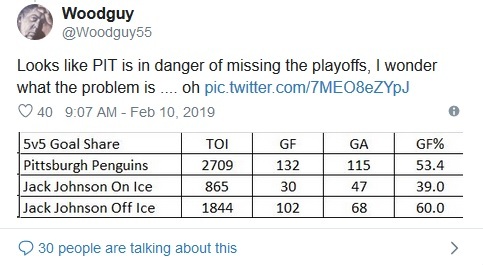 It is worth seeing if Maatta can play with Letang. If he can’t what is the point of paying him ~4M per year? At some point he has to be an asset and be able to provide more than a #5ish guy. The bottom pairing won’t be good because Jack Johnson will be on it, but with this setup you are going all in with your top four. As a coach you need to maximize the potential of your roster and I think the suggestion above would be something that could accomplish that goal. We might even get the Malkin we’re all waiting for back on a nightly basis. My prediction? Mike Sullivan goes back to what he knows best with Dumoulin-Letang and saddles Justin Schultz with Jack Johnson. The Penguins won’t admit how bad the signing was and they will trot out Johnson with every last Penguins defender.